A new scientific study shows that debris coverage -- pebbles, rocks, and debris from surrounding mountains -- may be a missing link in the understanding of the decline of glaciers. Debris is distinct from soot and dust, according to the scientists. Melting of glaciers in the Himalayan Mountains affects water supplies for hundreds of millions of people living in South and Central Asia. Experts have stated that global warming is a key element in the melting of glaciers worldwide. Bodo Bookhagen, assistant professor in the Department of Geography at UC Santa Barbara, co-authored a paper on this topic in Nature Geoscience, published this week. 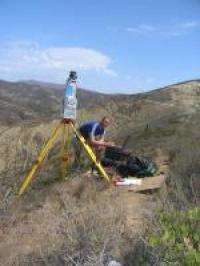 The first author is Dirk Scherler, Bookhagen's graduate student from Germany, who performed part of this research while studying at UCSB. "With the aid of new remote-sensing methods and satellite images, we identified debris coverage to be an important contributor to glacial advance and retreat behaviors," said Bookhagen. "This parameter has been almost completely neglected in previous Himalayan and other mountainous region studies, although its impact has been known for some time." The finding is one more element in a worldwide political controversy involving global warming. "Controversy about the current state and future evolution of Himalayan glaciers has been stirred up by erroneous reports by the Intergovernmental Panel on Climate Change (IPCC)," according to the paper. "There is no 'stereotypical' Himalayan glacier," said Bookhagen. "This is in clear contrast to the IPCC reports that lumps all Himalayan glaciers together." 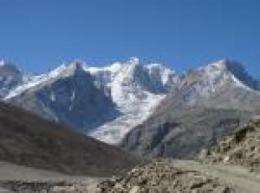 Bookhagen noted that glaciers in the Karakoram region of Northwestern Himalaya are mostly stagnating. However, glaciers in the Western, Central, and Eastern Himalaya are retreating, with the highest retreat rates  approximately 8 meters per year  in the Western Himalayan Mountains. The authors found that half of the studied glaciers in the Karakoram region are stable or advancing, whereas about two-thirds are in retreat elsewhere throughout High Asia. This is in contrast to the prevailing notion that all glaciers in the tropics are retreating. Bookhagen explained the difference between debris and coverage by soot and dust on glaciers: "The debris cover has the opposite effect of soot and dust on glaciers. Debris coverage thickness above 2 centimeters, or about a half an inch, 'shields' the glacier and prevents melting. This is the case for many Himalayan glaciers that are surrounded by towering mountains that almost continuously shed pebbles, debris, and rocks onto the glacier." Thus, glaciers in the steep Himalaya are not only affected by temperature and precipitation, but also by debris coverage, and have no uniform and less predictable response, explained the authors. The debris coverage may be one of the missing links to creating a more coherent picture of glacial behavior throughout all mountains. The scientists contrast this Himalayan glacial study with glaciers from the gently dipping, low-relief Tibetan Plateau that have no debris coverage. Those glaciers behave in a different way, and their frontal changes can be explained by temperature and precipitation changes. Bookhagen described results of another of his recent studies on this topic. He said that one of the key findings was that the Western Himalaya, including the Indus catchment and regions in Northern Pakistan and Northwestern India, depend heavily on seasonal snow and glacial melt waters, while Central Himalayan regions  Western India and Nepal  mostly depend on monsoonal rainfall. The smaller seasonal water storage space in the Central Himalaya, which has only steep glaciers and no large snow fields, makes this region much more vulnerable to shifts in monsoonal strength and to glacial melting, explained Bookhagen. River discharge in these regions is crucial to sustain agriculture, hydropower, and drinking water. If the Indian monsoon season is weaker because of global atmospheric changes such as El Niño, then Central Nepal must primarily rely on water coming from the seasonal melting of glaciers and the small amount of snowmelt that is available. "Retreating glaciers, and thus a reduction of seasonal water storage in this region, have a large impact on hundreds of millions of people living in the downstream section of these rivers," said Bookhagen. "The mitigation and adaptation strategies in the Himalaya Mountains thus need to take into account the spatial climatic and topographic variability. There is no regional solution, but only different local strategies to the future water shortage. The geographic setting of High Asia poses political difficulties as future water treaties need to be carefully evaluated." I've noticed that the last snow to go around here is the plowed piles in the big parking lots of stores and they are always covered with a lot of dirt, I guess it accumulates on the surface from melting. They hang around when all the rest has been gone for many days. It seems counter intuitive because the dirt is dark and you would think it would make the snow melt faster. Maybe I'm wrong and it's just bigger piles but it seems the clean piles are always gone. They put so much sand in the lots that the plowed snow is loaded. Great observation. I've noticed that effect on glaciers too. It just never dawned on me that the way glacier ice sculpts out divets could be caused by debris. Some ice forms dimples or divets usually with some dark debris on the sun side of the scallops. I always thought dark absorbs the light and caused melting faster (which it does) but apparently if the particle size if large enough; there is a ratio of absorbed heat to release rate that effects melting. Interesting science. The article and the comments from Moebius and Howhot make a lot of sense, well done! But it does make me think that the 3rd world need to address the over population problem, but how? I would suspect that several dynamics are in play when it comes to the rocks or debris. At .5" I would guess the debris size to be about that size or slightly smaller as well, since it's slide rock from above it would have irregular sharp sides. You would have shade, ventilation, convective cooling of the rocks themselves with the winds blowing through them and proximity to the glacial surface. The offset increase in surface temp of the rocks cooled by the underside ac system would create a much lower temp in the surface ice and hence slow the melt with relatively little direct solar energy reaching the glacial surface.